Portable Drying Rack - 100 Shelves 10"x18"
Without a special drying rack, art projects can literally take over a classroom and leave you with no space while work dries. Depending on how many sheets have to dry at once, these drying racks let you dry projects from an entire class while taking up minimal space. If you need a high-capacity drying rack but are very tight on space, then the 100-shelf DRY-1810 model is a wise choice. The unit features all-steel construction and a powder-coated, rust-resistant shelf finish. 100 racks give you ample room for drying a large quantity of work. Yet this unit is easily portable so you can move it between the classroom and studio easily. Each metal shelf measures 10 by 18 inches and there are six ten-inch mesh openings to allow for quick evaporation. Swivel casters allow for portability and easy positioning even when unit is fully loaded. Powder-coated shelves provide non-scratch handling of art work. 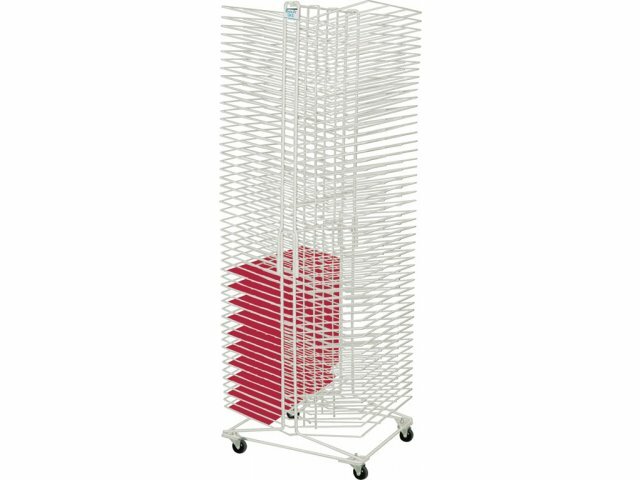 Keep your students projects protected and your art room looking organized with this portable drying rack. Ultimate Durability: Racks boast an all-steel construction, powder-coated and rust-resistant, that will serve you well for many years without warping. Wire-reinforced shelves ensure stable stacking of your projects. Mobile Convenience: With swivel casters, this unit can be moved smoothly and easily to wherever you need it. 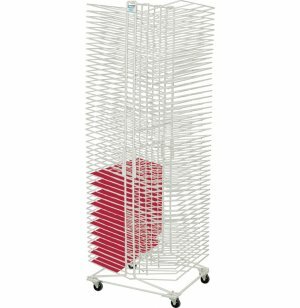 Speedy Drying: Shelves with mesh openings are well-spaced to promote efficient and quick evaporation drying of art projects. Space-Efficient Design: Keep your classroom or art studio in neat order with these racks, using only a minimum of space to dry a large number of projects without crowding.